From the earliest days of renewed European contact with Newfoundland in the 15th century, Britain treated the Island and the Labrador coast differently from her other overseas holdings. Newfoundland's uniqueness flowed from the value placed upon her as a seasonal berth from which to exploit the cod stocks of the Labrador current and the Grand Banks. Courtesy of the Provincial Archives of Newfoundland and Labrador(PANL NA 3137). with more information (85 kb). Whatever the merits of the debate over John Cabot's landfall, whether Bonavista Bay or Cape Breton, the merchants of Bristol and the English West Country had secretly exploited the fishery for some years before 1497. Even in a pre-mercantilist age the value of the fish staple, for domestic consumption in Great Britain and for export to Roman Catholic Europe, was appreciated. Athwart the main path of communications, between Europe and North America before 1800, the Island was a pawn, subject to great power rivalry and war. England claimed it, France powerfully contested it, and Spain had used the Island for fishing from the earliest days. 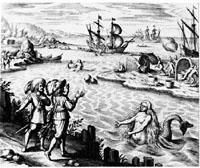 A highly efficient whaling industry pursued by French and Spanish Basques in the 16th century is apparent from the recent archaeological discoveries at Red Bay on the Strait of Belle Isle.